The Arts Club of Washington presents a one of a kind exhibit that will surely wow you. A magnificent collection of art has been created by some very talented independent artist and copyist at the National Gallery of Art in Washington, D.C. Each copy has been created in front of the original masterpiece. As copyist, we learn and perfect our skills by studying the styles, history and procedures of great painters from the past as the master artists we copy did before them. Come out, meet the artist and enjoy a fun evening of great art. Opening Reception will be on Friday, January 5th from 6:30-8:30, The Arts Club of Washington, 2017 I Street and 20th NW. Parking options include free street parking on Pennsylvania Avenue after 6:30 PM, metered parking in front of the of the Arts Club, and at the Colonial Garage, 2100 Pennsylvania Avenue, where you can prepay and reserve a space online. The club is also within a few blocks of both the Foggy Bottom and the Farragut West and North Metro stations. For more information go to the Arts Club of Washington. This event is free and open to the public. Note: this exhibition is not organized, supported, or endorsed by the National Gallery of Art. Mary Cassatt was the “new woman” of the 19th century – a highly-trained artist who never married. During the Impressionist Period, when female artists were generally dismissed with contempt and confined to painting indoors, she competed admirably with established male artists. She even developed a close friendship with Edgar Degas while living and working in France, and the two became close collaborators for a long period of time. By 1866, Cassatt had established herself as a uniquely skilled painter of mothers and children. Many believe Children Playing on the Beach was a tribute to her sister, who died in 1882, and was perhaps inspired by a trip she took with her ailing mother to Spain, where the two sought the healing power of the seaside climate. Whatever the muse, this work was clearly special to her. Children Playing on the Beach is very special to me. It was a favorite of my late husband, who never got to see it in person, and after it was relocated to Gallery #85, I simply couldn’t resist copying it. I also love this work because it’s one of the best demonstrations of Cassatt’s superior skill with color and process. Palettes were quite limited at that time, and yet she’s able to bring out so many shades that the painting almost appears to echo contrasting moods. For example, the subtle blues of the ocean and sky effectively convey the feeling of cool, possibly dreary weather over the sea, while the vivid blues she uses in the girls’ dresses evoke a feeling of warmth, sunshine and happiness. She was an absolute genius with color. As most paints do, Mary Cassatt’s have aged over time. I could have chosen to copy Children Playing on the Beach using my interpretation of the colors she used in 1884, but instead I chose to create a copy as close to the current version as possible. As always, it will be a challenge because matching color is one of the most difficult tasks a copyist faces. I’ve learned a great deal from Mary Cassatt. Her remarkable use of color as well as her ability to manipulate brush and paint to create beautiful strokes is inspirational. Join me in Gallery #85 where I’ll be working on copying another wonderful Impressionist painting The Harbor at Lorient, 1869, by Berthe Morisot. I’m back in the Impressionist gallery, #85, at the National Gallery of Art, Washington, DC. I spent a couple of months in the American Gallery painting “Right and Left” after Winslow Homer. I love the excitement and activity of the Impressionist Galleries. It’s a bit noisier than other galleries but even some of the guards like it best for the same reasons I do. The “Harbor at Lorient” is a little jewel that I’ve wanted to paint since it came into the gallery. But because paintings are often sent out on loan to museums around the world, I had to wait for it to come back from tour even though I had previous approval on availability. Berthe Morisot is the first female artist whose work I have copied, although we have many wonderful paintings by women artists. The “Harbor at Lorient” was painted when Berthe visited her newly married sister, Edma Pontillon, in the summer of 1869 while she was living in Lorient, France. Edma was married to a navy man and did not have children. Since both girls were interested in painting they were free to spend their time painting outside. During this period Berthe was experimenting with a highly Impressionist style. The “Harbor at Lorient” draws the eye to the sky’s refection in the water and expresses both movement and the future. The boats in the background are leaving from the port and moving to another location, a symbolic reason to create this work as she moved into Impressionism. The harbor is lit from the right hand side which is clear from the line of shading that runs across Edma’s body. Her parasol protects her face from the sunlight but the bottom of her dress is radiant in sunlight. The tone of this work is merry and positive. When Berthe returned home she anxiously showed her painting to artist friends and colleagues and it was declared as one of her best works. It found it’s way to the first Impressionists showcase. Unfortunately, the “Harbor at Lorient” received a critical reception, deemed painted too spontaneously and casually for the time period and with an unfinished feel. However, after her death, the painting was displayed in a large number of countries and has been well-received by its many viewers who today acknowledge it as one of her foremost Impressionist paintings. Berthe was influenced by Carot, Manet and Monet. She was very close to her sister Edma, who was the model in many of her paintings. Berthe Morisot was a copyist at the Louvre. She is fast becoming my favorite female artist. Two years ago I began painting scenes of Frederick and other significant memorabilia on holiday ornaments. These ornaments have been very well received by the public and have become a valuable piece of one-of-a-kind artwork for many collectors. This year I’ve added additional scenes and have created some commission pieces of homes and pets. The ornaments of Frederick landmarks as well as blank note cards of winter scenes in Frederick are available for sale at The Candy Kitchen, 52 N. Market St., Frederick, MD 21701 (301) 698-0442, and at the Delaplaine Visual Arts Education Center, 40 S. Carroll St. Frederick, MD 21701 (301) 698-0656. For special orders and commissions, please contact me through the SALES AND COMMISSIONS form on this web-site. Right and Left, a 1909 painting by American artist Winslow Homer, is the copy I’m currently producing at the National Gallery of Art. It’s quite a change from the Impressionist gallery where I painted for the past three years. It is a substantially different style. Also, I am physically located in a different gallery within the museum, one in which quietness and tranquility rule so I can concentrate with fewer distractions although I miss the hustle and bustle of the Impressionist galleries. Homer painted Right and Left a year before his death and is a culminating achievement of an extraordinary career. The title, provided by a viewer during the works first public showing, refers to the act of shooting the ducks successively with separate barrels of a shotgun. Scholars have suggested that the diving posture of the duck on the right indicates it is the one which has been hit by the hunter’s initial blast. Its mate is attempting to escape the second shot which has just been fired, the flash of the shotgun barely visible within the gray smoke at the middle left. This painting makes you want to stare at it and wonder what thoughts were on Homer’s mind as he worked. Perhaps he wanted to convey an ambiguous message deliberately, in order to illustrate that crucial moment of transition between life and death. Not ever being interested in hunting, I find this painting a bit sad but it is magnificently painted and although void of the brilliant colors of the Impressionist, it is filled with beautiful paint strokes and emotion. I will be at the National Gallery of Art, gallery #68, working on this piece every Tuesday until mid December when I expect to complete my copy of Right and Left. 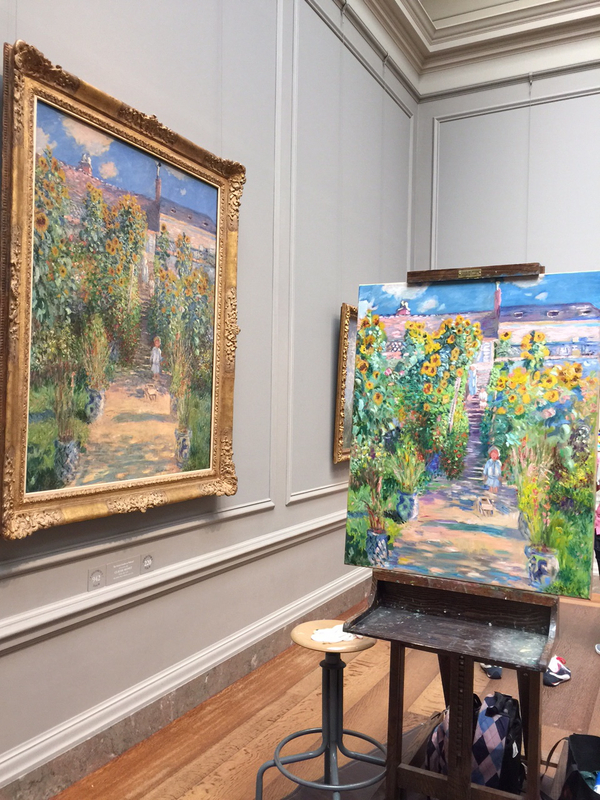 The latest project and the largest copy I’ve attempted is Claude Monet’s “The Artist’s Garden at Vetheuil.” This very popular painting seems to hang in every young girls bedroom, according to the buzz of the visitors at the National Gallery of Art. I remember when my daughter went off to college she decorated her bedroom with Monet posters. The attraction of Monet’s art seems to be the varied palette he used to describe light and shadows and its effect on objects. Everyone loves Monet! Monet planted gardens wherever he lived. He described objects with the colors that surrounded and were reflected from an object but by the time he created this painting in 1880, the painted surface was more important than capturing a spontaneous effect of light and atmosphere. This painting shows his young son with his toy wagon very spontaneously described as are other members of his family on the steps leading to the house. Monet could create a 60″x 48″ painting in just a few hours in order to capture the days long shadows often leaving the viewer wondering what the object actually is or is that really a person on the steps that lead to the house? My copy is not yet complete. I am still working on details and color adjustment so I plan to be in Gallery 85 for a few more Tuesdays. Stop by and say hello. Henri Matisse was one of the most influential artists of the early 20th century. He achieved this status primarily through the revolutionary use of brilliant color. Matisse often exaggerated form to express emotion. Born in 1869, Henri Matisse first began a career in law. However, in 1891, he began to study art. He started by taking a drawing class in the morning before he went to work. Then, at age 21, while recuperating from an illness, his true vocation as an artist was confirmed. As has happened in the lives of many artists, Matisse decided it is never too late to follow your passion. Matisse went through many changes in his style and was influenced both by artists who came before him as well as contemporaries. He was particularly taken by the work of Georges Seurat and Paul Signac who painted in a “Pointillist” style with small dots of color rather than full brushstrokes. A love of bright colors is what Matisse is most known for today. He produced major creative breakthroughs in the years 1904-05 eventually leading to the emphasis on capturing mood rather than merely trying to depict the world realistically. I was drawn to Still Life with Apples on a Pink Tablecloth because of the unique placement of the composition and the majestic use of color. Like many of the paintings that hang at the National Gallery of Art (NGA), the years have somewhat dulled the paint used by the original artist. I try to imagine what the painting looked like when it was created in 1924 and try my best to reach back in time to recreate the luster that was intended by Henri Matisse. It is always a challenge but what a privilege it is to be at the NGA doing what I love to do. I don’t even think twice when I have to wake up at 4:30 am every Tuesday morning to begin the 50 mile journey to the museum. I’m currently in gallery #81. Stop by and say hello! Tuesday, April 8, 2014, was the fifth day of copying Woman with a Parasol – Madame Monet and Her Son. I love the atmosphere in the Impressionist Galleries. Everyone has been searching for spring this year and we just haven’t been able to find it. However, in the Impressionist Galleries, it’s always spring and I love being there! Visitors are happy and the mood is grand. I can feel electricity in the air when folks enter the galleries to view the magnificent works of Monet, Renior, Cezanne, VanGogh, Picasso, etc. Color explodes inside these rooms and I enjoy every minute I’m there. This is my second copy of Woman with a Parasol. It was so much fun copying it the first time that I decided to produce a second copy, and try to make it even more perfect. But mostly I am simply excited at being in that room. Monet favored painting landscapes – a subject that was attuned to outdoor painting. Impressionism evolved in the late 1860’s from a desire to create full-scale, multi-figure depictions of ordinary people in casual outdoor situations. It is believed that Claude Monet painted Woman with a Parasol in just 4 hours, very spontaneously as is evident particularly in the clouds and conveyed by a repertory of animated brushstrokes of vibrant color. Bright sunlight shines from behind Madame Monet making her appear in silhouette while color reflections from the wildflowers below touch her front with yellow. This is the perfect time to visit the National Gallery of Art. The cherry blossoms will be in full bloom within days and spring has decided to finally pay us a visit bringing an abundance of color inside and out. I’m in gallery 85 every Tuesday. Come by and say hello! Woman with a Parasol is one of Monet’s most popular works and attracts a great deal of visitors to the National Gallery of Art. I enjoy the opportunity to be able to speak and discuss this masterpiece with the public. Looking at the latest photo of “Riverbank” you can’t see much difference between the previous weeks photo images and the current one. One needs to see it in person and get up close to study the variations. After an additional 5 hours of copying “Riverbank,” I’m beginning to feel it is coming close to the end. My last session will be toning down colors with glazes in order to make the painting look more like the original. As I’ve mentioned many times before, my copies are always brighter in color, the result of newer, fresher paint. Often the public prefers the brighter look. By 1886, a year after Cezanne completed “Riverbank,” his financial troubles were at an end and he was free to pursue his commitment to painting without outside interference. He preferred to spend his days in solitary pursuit of those ambitions in painting which were as vivid to him as they were obscure to others. He begins to paint with confidence and robustness, with an ambition and clarity about his work that suggest an artist coming to terms with his own temperament and realization. Many of Cezanne’s most distinctive subjects, like “Mont Ste-Victoire” and the “Card-Players,” made their definitive appearance at this time. The paintings of this period of his life show a rich interplay of colors, gestures and a massiveness that reminds us of the hard-won mastery that Cezanne had achieved in his thirty years as a painter. The weather is getting milder (we hope) and visitors and art lovers are starting to venture out to see the sights in Washington, DC and the great new exhibits at the National Gallery of Art. I look forward to seeing friends and family at the NGA. Let’s have lunch together, I’m in gallery #84. © Sonia Gadra and soniagadra.com, 2010-2019. Unauthorized use and/or duplication of this material without express and written permission from this site’s author and/or owner is strictly prohibited. Excerpts of text and links may be used, provided that full and clear credit is given to Sonia Gadra and soniagadra.com with appropriate and specific direction to the original content. This website is neither endorsed nor supported by the National Gallery of Art.